• On Feb. 20, 2013, a landslide took out 150 feet of roadway south of Page, closing the most direct route between that city and the rest of the state. • ADOT paved the 45 miles of Navajo 20, formerly a dirt road, designating it U.S. 89 Temporary. Completed in July 2013, the $28 million project cut the original detour in half. 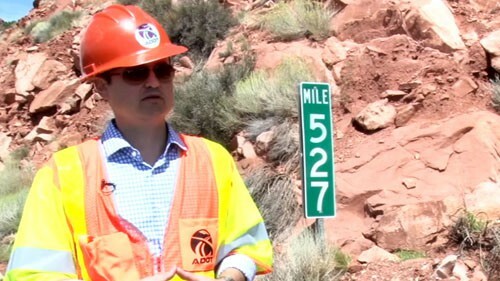 • In August, ADOT launched a $25 million project to the damaged stretch of U.S. 89. • Repairs are expected to be completed by May 2014. PAGE – As manager of the Lake Powell/Page Days Inn and Suites, Traci Varner has grown used to the call: A customer heading here on U.S. 89 comes to a traffic barrier and “Road Closed” sign with 30 miles to go. That confusion has been common, she said, since a February 2013 landslide knocked out the direct route, forcing a detour that she complains isn’t marked as clearly as it should be. 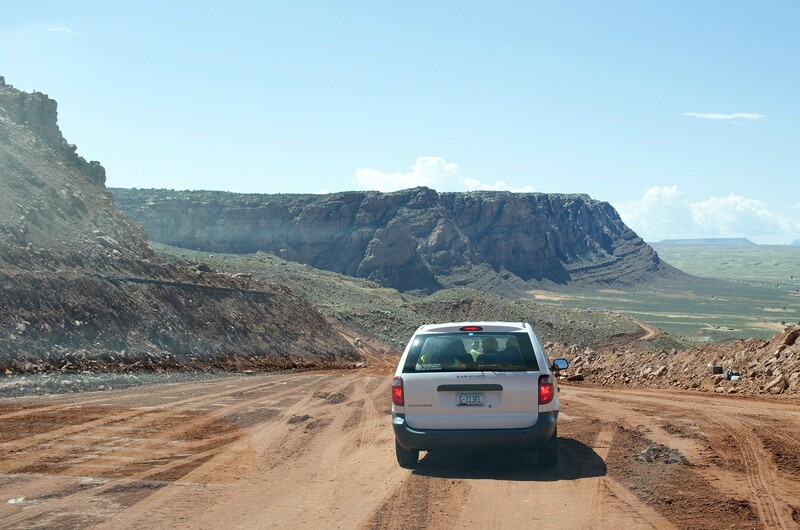 Those who miss it have to backtrack 25 miles and then take a temporary route, U.S. 89T, which follows what had been a dirt road through the Navajo Nation. That’s welcome news to businesses in this community next to Lake Powell on the Arizona-Utah line, nearly 300 miles north of Phoenix. Business has gotten better since the bypass was paved three months after the landslide and GPS systems updated the route, but Varner said the landslide has hurt business because of the perception that it’s difficult to get here. “We were down 20 percent last year,” she said. At the front desk of the Comfort Inn here, TheaRae Chee said she’s excited to have the project underway. She receives calls from people who mistakenly hit the roadblock or think they simply can’t reach Page. “If there was a sign we could put up we would,” she said. “In total, ADOT has installed and removed more than 200 signs since the initial U.S. 89 closure,” his email said. “We want people to know that Page and Lake Powell are open,” Krugel said. 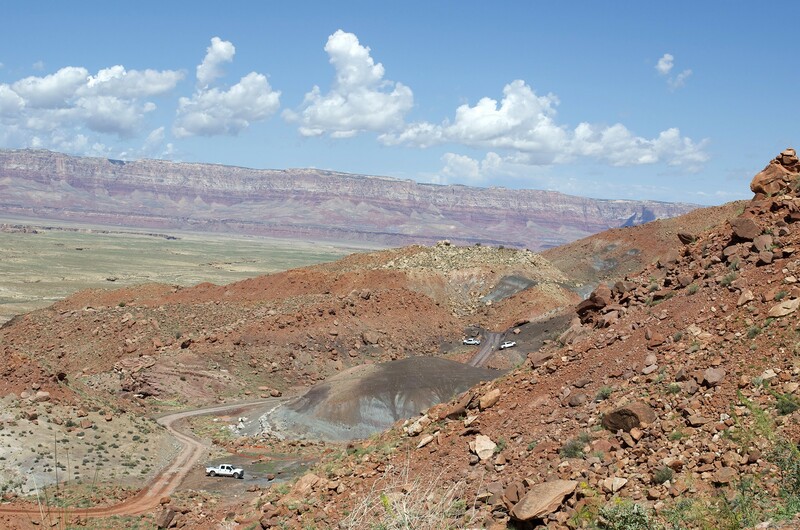 The $25 million project will restore a quarter-mile section of U.S. 89 covered by a massive landslide. It’s in an area where the highway climbs through mountains between the junction of U.S. 89/U.S. 89A and Page. ADOT’s investigation found that the section was built atop an ancient landslide, though that wasn’t known when the highway was built in the 1950s. 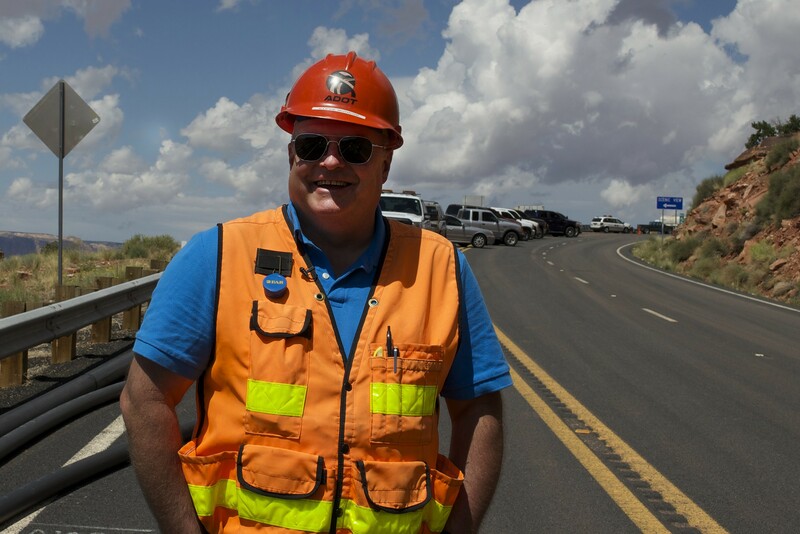 “Gravity has been pulling on this mountainside for eons, and it just happened to be time for gravity to win,” Steve Monroe, ADOT’s senior resident engineer, said during a media tour of the area. “The sooner we get this road repaired the better off all of the folks are,” Monroe said. For now, motorists heading to Page must travel 45 miles on what had been Navajo 20, a dirt road that was too rough for many vehicles before ADOT reached an agreement with the Navajo Nation pave it at a cost of $28 million and label it 89T. It will return to the tribe’s jurisdiction after U.S. 89 reopens to Page. At the Lake Powell/Page Days Inn and Suites, Varner said she’s happy to have work underway and that she understands why it’s taken until now for work to begin. Highway workers discuss the progress on U.S. 89, and their goal to have it ready for traffic before the summer tourist season. Cronkite News reporter Megan Thompson has the story. 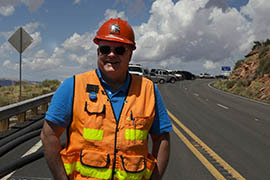 Steve Monroe, ADOT's senior residential engineer, said the plan is to have the direct route to Page reopened by May, prime time for tourists visiting that city. 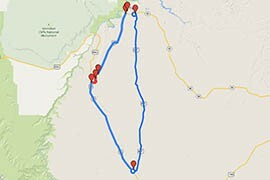 Explore the routes of U.S. 89 and U.S. 89 Temporary to and from Page. 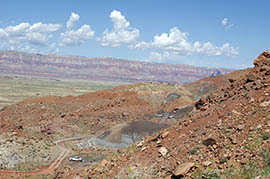 A vehicle crosses the construction site during a media tour of repairs to U.S. 89. The original road, buried by the landslide, can be seen at left. 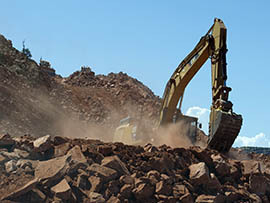 Construction workers are moving 1 million cubic yards of material to rebuild the section. Material removed from above the road is deposited below to create a buttress to reinforce the area.